The book I'm recommending to you today found its way into my reading list by an act of serendipity (one of my favourite ways to meet a great read!). There are times as a homeschooling parent that I wonder if I'm doing all that I can to nurture and foster a love of learning in my sons. I wonder how to broaden their understanding and at the same time have it start from their own motivation. At just such a time of inner questioning, I met this book at the library. 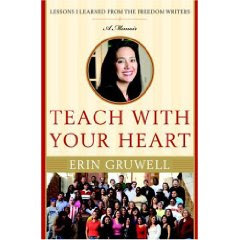 Interestingly, the title also grabbed my husband's attention and had him enthralled with the real life experiences of a new teacher, Erin Gruwell and her students before I had the chance to get more than a couple of dozen pages into the book myself. Teach with Your Heart is more than a story of a woman and the teenage students she was to teach. In my opinion, it is a moving and inspirational account of what can happen when you are willing to learn - which applies to the teacher every bit as much as the students in this book. Erin may have been the catalyst to reconnect the students with their dreams but she also experienced the power of what happens when you take action towards your dreams. Once both my husband and I finished the book, we suggested it to our sons to read. Before they could get to it, we relocated. After moving, I borrowed the movie, Freedom Writers Diaries , which is based on Teach with Your Heart from the library. The movie is well done and is an abridged version of the book. I highly recommend reading Teach With Your Heart first and then watching the Freedom Writers Diary as the book contains more details than they could include in the movie. Thanks for the recommendations Katherine, these look great! Yes, thanks. I've never heard of that one before and look forward to reading it. I have it on order from the library now. Did the boys watch the movie as well?